Video of Your Island Experience. The resort has 8 traditional Tongan thatched fales. Fale is the Tongan word for house. We serve a table d’hote menu with an International cuisine. We use locally grown organic produce to create many in-season island specialties. Treasure Island Resort is located on Eueiki island in the northern Island group of Vava’u, Tonga and is open all year around. It has the best and most beautiful powered sand beach in all of Tonga and is truly a South Pacific offshore private island dream destination. The resort is the only inhabitance on this magnificent 48 acre private island, making Treasure Island Resort the perfect destination for those seeking peace and serenity. The island is big enough to be interesting and small enough to get to know it. We promote harmony to maintain a peaceful environment. Our accommodation units are traditional thatched roof fales (Tongan word for house) and are powered by solar energy. We collected fresh rainwater which we filter and store in tanks for our use. The resort is connected to the outside world by VHF radio, mobile telephone, and wireless internet. We provide and serve local organic foods and we recycle where possible.The Tofua’a Moana is an environmentally friendly vessel, moving quickly, smoothly and quietly to provide you with the most comfortable boat transportation and with a quite approach to the whales during season. JULY. AUGUST, SEPTEMBER AND OCTOBER AT TREASURE ISLAND RESORT IS WHALE SWIMMING SEASON!! Swimming with humpback whales at Treasure Island Resort is amazing! During the months of July, August, September and October, we feature this unique activity of swimming with these magnificent gentle giants. The privileged location on which our resort is on has the only two deep water channel entrances into the lagoon which is the calving ground for the humpback whales. So begin with the advantage of already being in the center of the whale nursery by staying with us during the whale swim season. We are a licensed whale swim operator and we own and operate our own boats. We do not hire other boats as other local or overseas operators do and we cater only to our guests that stay with us at our resort for our whale swim tours. NOVEMBER, THRU JUNE IS SUMMER TIME FUN AT TREASURE ISLAND RESORT!!!! During the months of November thru June, Treasure Island Resort offers accommodation with FOC (free of charge) water and other in-house island activities such as kayaking, snorkeling, hiking and volleyball on the beach. PADI recreational scuba diving will soon be available at Treasure Island Resort. A support boat is available on site at extra cost. Please “click here” for more information on our available activities. Tofua’a Moana (Ocean Whale) designed and built by the resorts’ owner, Mark Belvedere was built on Eueiki Island and is a highly efficient traditional 37ft. outrigger. “Tofua’a Moana” was inspired by the Polynesian designed outrigger boats. This vessel is licensed to carry up to 8 passengers, a Captain and one crew and/or guide. We are very proud to utilize “Tofua’a Moana” as the vessel has an awning for share, is environmentally friendly and sustainable moving quickly, smoothly and quietly to provide you with the most comfortable boat transportation with a quiet approach to the whales during season. This gives you the best chance at approaching whales quietly and experiencing true interactive swims with these magnificent creatures. Moana Loloto (Deep Ocean) designed and built by the resorts’ owner, Mark Belvedere, is our newest addition to our fleet. Built in Nuku’alofa, Tonga, “Moana Loloto” is a 31ft. long, walk around cabin with a tunnel haul. She is our exploration and dive boat. This vessel is also very quiet and efficient. Moana Leka (Little Moana) is an aluminum 4.1mt. high tech “power cat” covered by a black awning that was designed by the company called Black Dog Cat” out of New Zealand. This boat is utilized for guest transfers, fishing trips, as a support vessel and as a supply vessel. 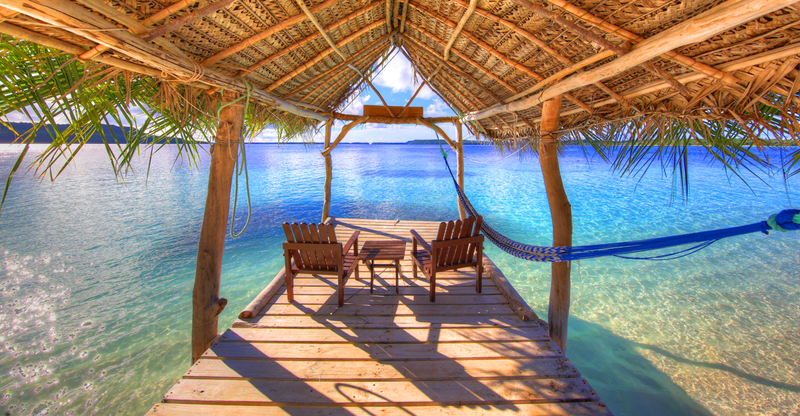 There is no need to choose between land and sea for your next holiday to Vava’u, Tonga. Explore this new vacation changing experience of bed, boat & beyond! You can experience all three by staying at our beautiful private off-shore island resort and combine your stay with us by going island hopping on board our classic yacht “Moana” and discover all the islands that “Vava’u Total Destination”® has to offer. Rates for this vacation combination will be posted shortly. Treasure Island Resort was acquired in 2006 and is managed by Mark and Veronica Belvedere. Mark is from the States and a former merchant marine. Over the years and uncountable sea adventures he became an experienced boat builder, speed sailor, sail and boat designer. In 1979, Mark started to design the PROA, a double hulled, double ended shunting vessel inspired by the type of vessel used by the Tongan people to make their remarkable voyages of discovery throughout the Pacific. Although based on this design, Mark built his boat out of high-tech modern materials and could sail up to two to three times the speed of the wind. In 1984, he invented and patented a unique sail with an airfoil shape. The “Flexible Wing Rib Sail” aka “Camber Sail”, has won 12 out of 16 speed sailing records and is used on all the sails for wind surfers throughout the world today. Veronica is from Mexico and has a background in the travel and hospitality industry having worked for the American Express Travel Company, Sheraton Hotels and other travel industry related companies both in the States and in Mexico. Mark and Veronica met in Mexico in 1997 and married in 2003. Former owners of a Tall Ship from 1885 the “Sunderland” Mark and Veronica had an extremely successful business and campaign sharing their passion about Maritime and sailing history off the coast of Cabo San Lucas, in Baja California Sur, Mexico which spanned an amazing 14 years. Thanks to that business and Marks’ love for Polynesian sailing and maritime history is how they ended up in Tonga. They visited Tonga for the first time in 2001 in search for the origin of the “Kalia” and honeymooned in the Island group of Vava’u 2003 where they fell in love with the area and decide to look for a place to create a “Seafaring Center” so that they could help revive the art of Polynesian sailing. So when you stay at Treasure Island Resort you will have the opportunity to learn about the highlights of the untold story of the greatest seafaring migration in human history. Please see more about our “Maritime History and Cultural” by clicking here. Other plans include showcasing the history behind the former King of Tonga’s 108-foot double-hull sailing canoe, the Kalia, along with the addition of an educational library and museum. Soon, visitors to Treasure Island Eco Resort Tonga will be able to experience smaller sailing outriggers while whale watching, fishing, or seafood gathering.